There is an Italian proverb -- chi non risica non rosica -- meaning he who doesn't take risks won't nibble anything. And I welcome taking risks in the kitchen when it leads to exciting and innovative dishes, so long as flavor remains paramount. 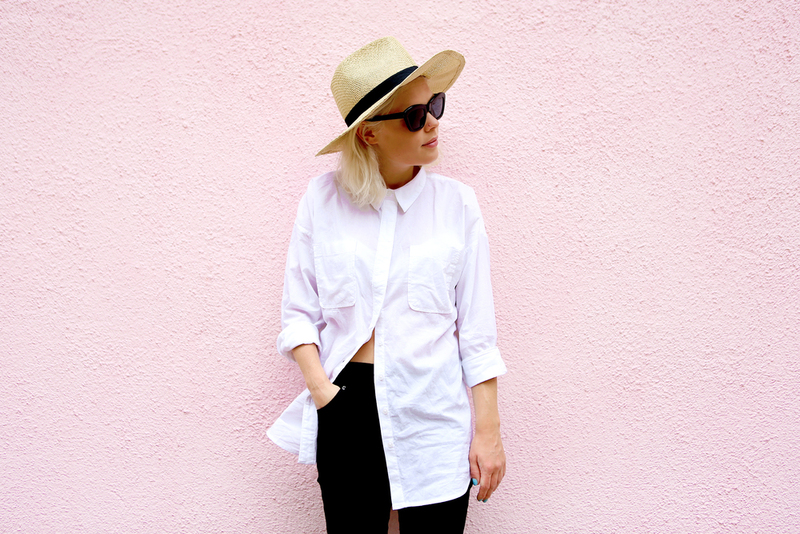 But when taking risks for its own sake is the priority, the experience suffers. 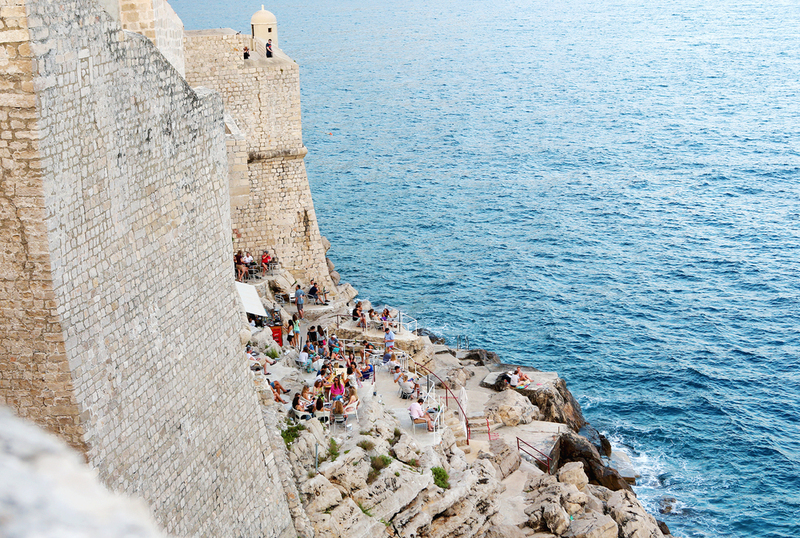 Chef Paolo Lopriore is such a risk taker. He intentionally uses flavors that other chefs shy away from, and with reason: to about 99.9% of the human population, they don't taste good. But taste is in the mind of the beholder, I had to keep telling myself throughout this roller coaster dinner at his restaurant, Il Canto. Il Canto is located in the Certosa di Maggiano hotel, a Relais & Chateaux property in Siena. The hotel is beautiful, both intimate and rustic. It's non-descript entrance gives way to a medieval courtyard whose focal point is a well dating back to the 13th century. 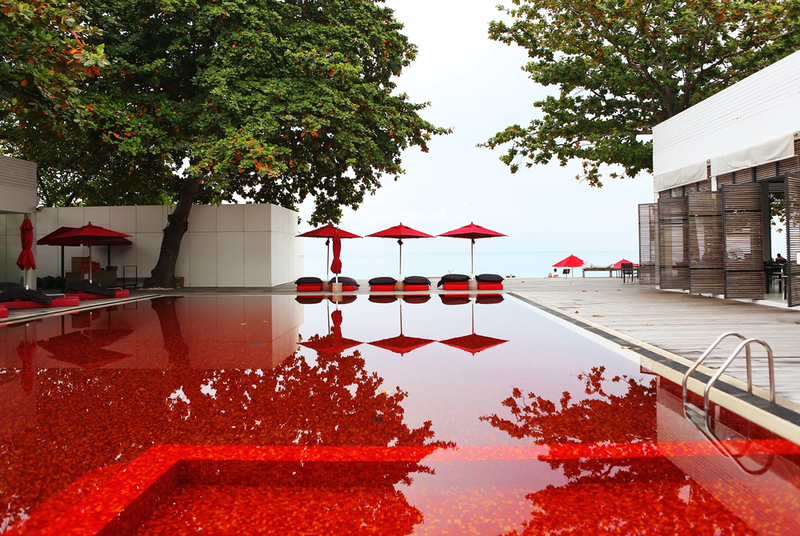 Bordering this open space, on the first floor, are salons for the hotel's seventeen guest rooms and outdoor seating for taking an evening apéritif. The second floor is where the hotel rooms are located, each with a view overlooking the courtyard. When we arrived, we were the only people around so our footsteps clicked on the cobblestone and resounded through the cloisters. If it were just a little warmer, we would have stayed outside in this calming atmosphere for a bit, a silent and surreal pause before dinner. Instead we were led inside where our Genovese friend suggested we start things off with a drink. We were taken into a smaller emerald green room with pre-Renaissance battle paintings and, more importantly, big comfortable couches. Our sitting and talking turned to walking around and exploring the different chambers of the mansion-like restaurant. Their vaulted ceilings and grandiose decor suggested this place might have formerly been the home of a king. Or the home of Mike Tyson. Perhaps both. When we returned to the green room, we were handed a small plate of amuse bouche-like snacks to entertain. The best of the group was a slice of foie gras sandwiched by green apple and licorice sugar glass. The licorice paired with the creamy foie gras tasted cool and crispy; the apple made it sweet and tart. Another interesting bite was a sardine in gelatin with fennel. Lopriore gets wild fennel from near the restaurant, and Aaron claimed he caught a tinge of its anise-like sweetness here. But to me, it was rather bland. A dehydrated onion chip was crispy and just mildly piquant. We had a Shanghai throwback with a piece of steamed bread with lardo, very reminiscent of a Chinese pork bun. Lastly, spoons dusted with a powder of pumpkin and Grand Marnier, which I found too boozy to be enjoyable and Aaron found merely too powdery, like trying to swallow dirt. Each of these amuses hit different parts of the tongue and flavor spectrum: salt, bitter, sweet, sour, and spicy. If the intent was to awaken the palate, it certainly did. We were led to a niche next to the main dining room, which was quaint and beautiful. There were two other tables in our room, which remained empty the entire night. The space felt very light and open, as three walls had large doorways and the fourth, a large window overlooking the courtyard. Temperature was, unfortunately, a bit of an issue. Since there were so many open doors and windows, the chilly night air from the courtyard poured in. Aaron put on his scarf, and our Genovese friend continued to eat with his jacket on. Perhaps that's par for the course when eating in a monastery built in the 14th century on a very early spring evening, but it was bothersome nonetheless. (When we mentioned the problem to the staff a couple of times, things did improve, but if you ask Aaron, not nearly enough.) We were then brought menus, which we glanced for about 1 second before asking if an extended tasting menu might be possible. Chef Lopriore came out of the kitchen to say hello, a very kind and jovial man, and explained that he would gladly provide a tasting menu that highlights his cooking. Any allergies or aversions?, he asked. Nope. He explained that he would keep bringing out courses until we said "stop," a word that wasn't exactly in our vocabulary. But perhaps we should have learned it beforehand. First we were given a snack called mangiare/bere cocco/curry, or eat/drink coconut/curry. A curried cube of potato walked the tightwire on top of a rum-laden coconut drink. I started by eating the curried potato first, whose flavor which quickly reminded me of the Indian vegetarian dish Batata nu Shaak, part of India's western Gujarati cuisine. The potato was good enough, but the drink below tasted like the final sips of a piña colada where all that is left is the bitter alcohol flavor of rum. If the point of this was a slap in the face, much like throwing a bucket of ice cold water over someone while asleep, I was awake. The first official course was the insalata di alghe, erbe aromatiche e radici, a minimalist salad of seaweed, aromatic herbs and roots. This included nori strips, radish, coarse salt, hot mustard, ginger, wasabi and mint. After the first bite it became immediately apparent to me that chef Lopriore had spent time in Japan, not because of the conspicuous presence of Japanese seaweed or wasabi, but because of the flavor profile activated in this incredibly balanced savory dish. With just raw vegetables, Lopriore touched every part of my tongue except sweet. This is the gastronomic equivalent of a triathlon, an exercise in the flavors of bitterness, brine, and heat. Aaron likened it brushing one's teeth, which is to say it doesn't taste particularly pleasant, but it leaves your mouth feeling fresh and clean. It would be unfair to judge this particular dish solely on flavor since I do not believe that was its intention -- it reset my palate without sugar to properly prepare for the courses to come. At least, that's what I told myself. The next course brought pino, asparagi, midollo e tartufo, medallions of bone marrow covered with truffle slices and flanked by batons of asparagus and foamy mounds of a disastrous parsley-garnished pine mousse. The first thing that put me off was the pink tinge of the bone marrow, which was essentially raw. I'm not against eating things raw, and in many cases I prefer it; but not for the marrow center of cow bones. I'm not sure that I can justify that sentiment any further, other than mentioning that the color frankly made me a bit nauseous. I didn't understand the addition of truffle. The thick crumbly slices of it were shaved in the kitchen so they had essentially no perfume by the time they arrived at the table. But the absolute worst component of this dish was the incredibly bitter pine mousse. Bitter like the white part of a grapefruit between the skin and the fruit. Bitter like your mother-in-law when you decided to spend Christmas with your folks instead last year. I sometimes enjoy vegetal bitterness; but when combined with the subtly-flavored ingredients here, it completely overpowered them. After having studied closely flipped casually through Chef Lopriore's dishes in Sei, his multicolored risotto was high on my wish list. I was ecstatic when I saw shallow plates of rice being brought to the table, particularly with the rich and earthy smell of saffron teasing my nose. The dish, riso giallo or yellow rice, was not much for presentation as the borders of the plate were "decorated" with runoff of the broth in which the rice was cooked. The first bite was delicious, a dance of Sichuan peppercorn and saffron on my tongue. "Hey, I wonder what those medallions are in the center," I thought to myself. Perhaps hearts of palm or more bone marrow? No, no. I tried a piece, and if my tongue had fists, my entire face would be black and blue. Concentrated bitter lemon and grapefruit. Bitter as in tongue-clenching, "where is the water?" bitter. Terrible, an absolute assault on the palate. I glanced across the table at Aaron to see if I was the only one who found this course -- to put it mildly -- unbalanced. But he was shaking his head, saying "If this guy does this one more time, I'm leaving." Meanwhile our Genovese friend chimed in as well: "brilliant," he exclaimed. Um, what? We spent the next thirty minutes discussing and dissecting what the bloody hell was going on. "When you get to my age," our friend explained,"you want strong flavors ... you no longer eat for the routine pleasures of the palate, but rather for new experiences that shake you and shock you, making you think about flavors in new ways." Although perhaps a little patronizing as in "you're too young to understand why this is good," there is certainly some merit to his statement. But if eating is only for the shock, why not drink lighter fluid, stick your finger in a light socket, or eat marmite by the spoonful?? Is it worth sacrificing flavor solely for the purpose of a new experience? Not in my book. I took a deep breath when our waiter explained that the next course would be tepid ravioli. Cold pasta, particularly ravioli, never attracted me. 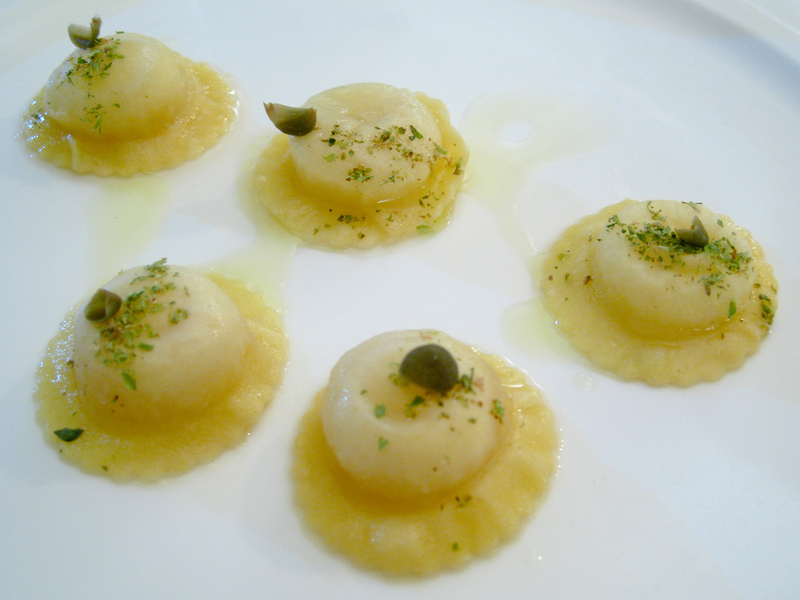 Ravioli di moscato, capperi e origano di Serraggia followed, ravioli of moscato wine, capers, and oregano from Serraggia. Each raviolo was plump and inflated with moscato, not an easy task, clearly demonstrating the masterful technical skill of chef Lopriore. Then came the first bite. And it was the last. The flavor that burst forth from the little pillow of pasta was like rubbing alcohol, a surprising and overpowering bitterness. Maybe chef Lopriore's goal was to utilize a flavor profile not frequently used in Italian cooking. But Aaron began to collect his belongings question how much more of this gastronomic assault he could take, and I could see him assembling a mental list of other restaurants that remained open if he headed back to the city center. I did not enjoy that dish to say the least, nor did Aaron; however our Italian friend, once again, had a huge smile on his face and a sparkling white plate. "Genius," he exclaimed. I nearly choked in confusion. Were we talking about our meal the day before? For the record, our friend is 61 years of age and has a very experienced palate; this was the only restaurant throughout our hedonistic gastronomic adventure where we were in such disagreement. I sought desperately to understand what was making this meal so enjoyable for him, yet so miserable for us. Could it be that things taste different at certain ages? Could it be that people just taste differently? I'm not sure, really. But fortunately things finally improved with the next course, frutta secca and salicornia, a light salad of dried fruit and sea asparagus containing almonds, almond butter, pistachio powder, pistachio butter, frozen almond milk foam, and seawater granita. The pendulum swung from bitter to boozy with the prior two courses, and stuck in neutral for this salad. As a very delicate mix of flavors, this was well-balanced allowing each ingredient to be tasted completely. The textures here varied from water-bursting sea asparagus to thick nut butters and crunchy almonds and pistachios. The flavor was very controlled and unsweet, much like Japanese kaiseki courses whose ingredients often sing unique notes alone but sum to create a more neutral flavor profile. 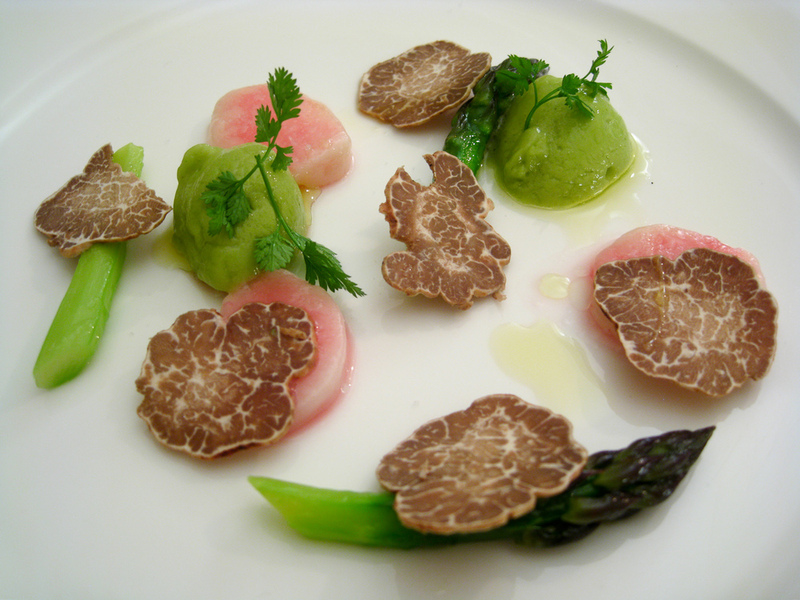 While I enjoyed this dish for the gentle salty taste of the sea asparagus, the frozen almond milk foam was flavorless. Nonetheless this was a soothing break from the last two courses, and hopefully a sign that things would pick up from here. And it did. The next course was the best of the evening, monocromo di scampi, a monochrome of raw shrimp. The plate had thinly sliced raw shrimp served in a sauce made from the shrimp head. The texture was both chewy and slighty crunchy, the sweet flavor of the shrimp accentuated by the citrus in the sauce made from its head and carcass. "I taste shiso," I said as I glanced around the table looking for approval. "No, mine tastes like tangerine or lemon," Aaron replied. We started to debate the flavors in this dish when the chef Lopriore came over and explained. Each plate actually had different spices underneath the scampi, so all of our dishes were different. 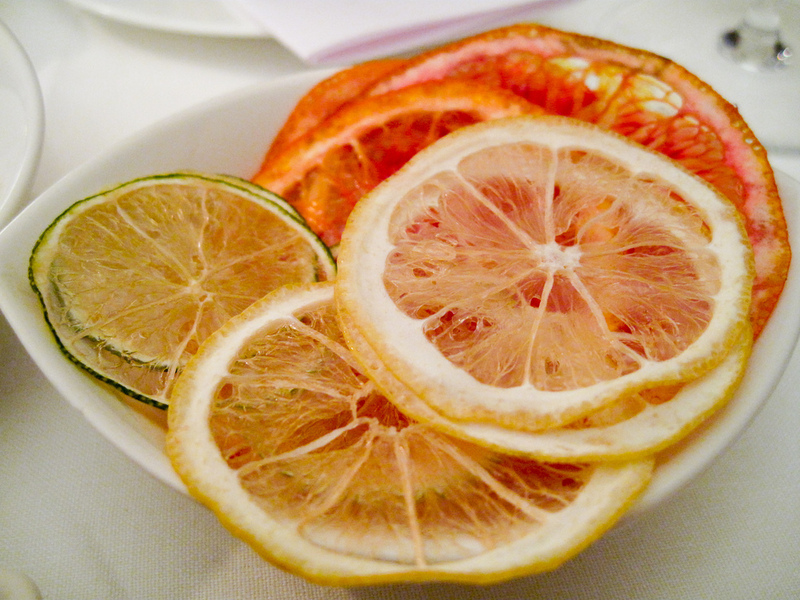 He used lemon in four different forms -- salted and preserved (as found in Moroccan lamb tagines), green (i.e. unripe), juice, and zest -- and a touch of cumin. This was a clever and intellectual twist to show the different sides of an ingredient that at first glance is quite simple. Furthermore, each part of the plate had a different flavor, as he hid the spices underneath the shrimp so it was impossible to see. This was a dynamic and changing dish, where no two bites were the same. Very interesting, not to mention tasty. But just as things were getting good, I again found flavors and textures in my mouth that just did not belong. The next course was inspired from the Tuscan wedding soup ribollita, or re-boiled black cabbage. 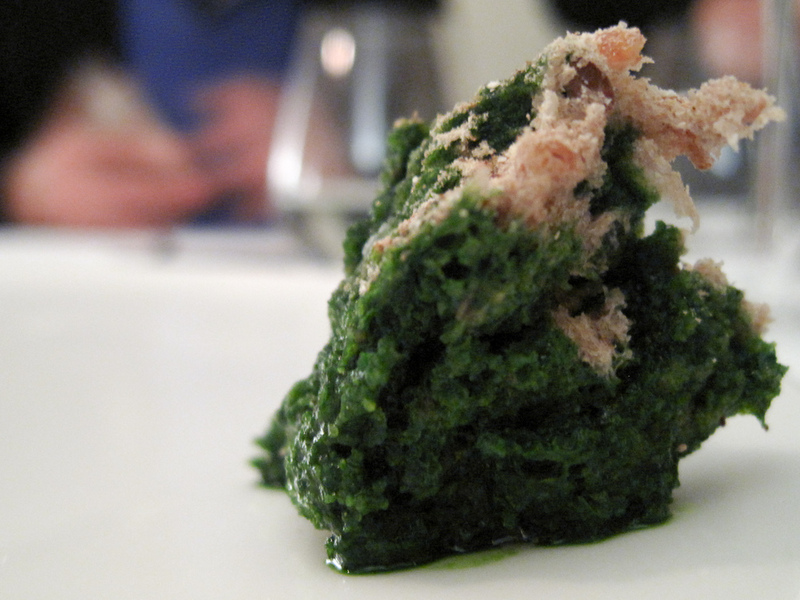 Named zolla di certosa, or clod of Certosa, this sponge-like heap of cavolo nero was cold, wet, mushy, and flavorless. It tasted like crustless white bread dipped in water and eaten immediately. Aaron, meanwhile, winced at the bitterness of his. Yes, that's what cavolo nero tastes like -- when raw or undercooked -- but this was just too much, he thought. In other words, we both agreed it was horrible. It did nothing for my palate other than aggravate me. There was nothing intellectual about this dish, other than me thinking about how many seconds away the nearest waste bin was if I ran to spit it out in disgust. I truly wish I had not eaten this. Petti di piccione in "civet," or pigeon breast in a sauce made from its own blood came next, and it sure looked and smelled delicious. The breast was impeccably cooked, both juicy and tender. It was rosy pink and very lean, with the meat having a slighty rough texture that looked perfect for soaking up the blood sauce below. The pigeon was served with broccoletti, blueberries, and orange clam. Looked delicious; tasted not delicious. The sauce did not taste of blood; rather, it tasted of black pepper and alcohol that had not completely burned off. My tongue was tingling from the black pepper which made it very difficult to taste anything else. What a shame, I thought, this dish not only had so much potential but the cut of pigeon was nearly flawless. Why was the sauce so strong? By this point in the meal, I had given up trying to rationalize chef Lopriore's decisions. There was no longer consistency, nor a clear vision or direction of what he was trying to accomplish with the use of such strong flavors that obscure the taste of the other ingredients. My patience had worn thin and my palate, exhausted. The only dishes I had enjoyed up to this point were the sea asparagus salad and the monochrome of scampi. I just wanted to cut my losses and return home. The last main course was animelle di vitello, trippe di baccalà e cavolo nero or veal sweetbreads, cod tripe and black cabbage served with peas, fava beans, and lime zest. The sweetbreads, like the pigeon before it, were just beautifully cooked, tender and juicy with a creamy semi-solid texture that melted in my mouth. The flavor was rich and nutty, and when eaten with the barely blanched peas and fava beans the texture become much more interesting and diverse. 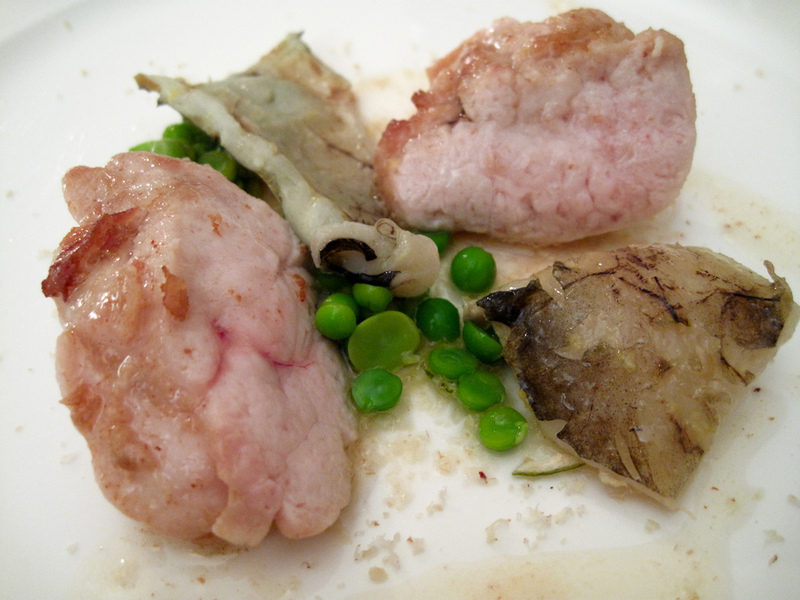 I did not like, however, the salty and fishy cod tripe which took over the sweetness of the sweetbreads. Yet another course that had so much potential lost to an ingredient that completely dominated any other flavors on the plate. 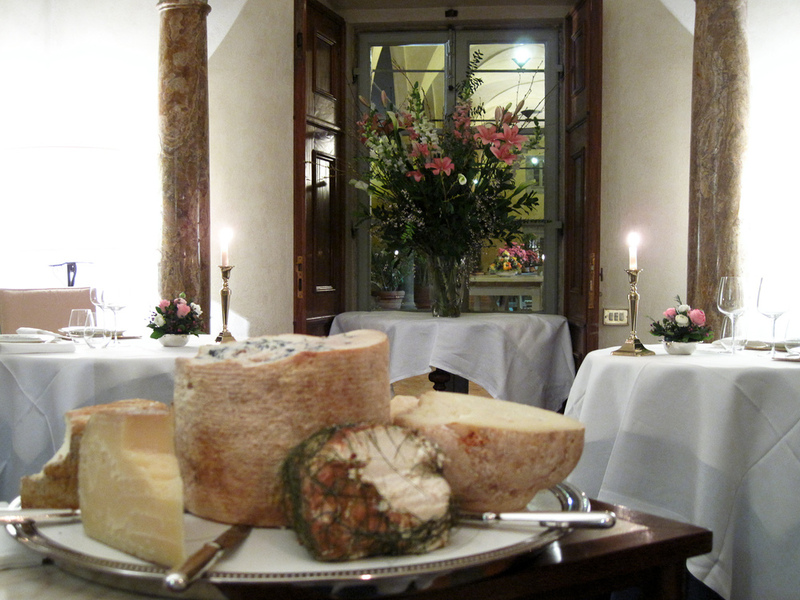 The cheese cart came next with a moderate selection of Italian artisan cheeses. I was happy knowing that Lopriore did not make these I would get a chance to try cheese not readily available in France. The most interesting of the bunch was the seirass del fen, an aged Piedmont cow milk cheese rolled in hay. The cheese had a very full flavor and a semi-soft, creamy texture with hints of citrus. Aaron enjoyed a more aged provolone, but didn't find the pecorino di Pienza to be particularly special. The cheeses came with various citrus chips -- lemon, lime, and orange -- and, oddly, fresh fava beans. Interesting accompaniments that were okay on their own, but I can't say any of them made much sense eaten with any of the cheeses. Our pre-dessert came in a test tube, filled with two layers of some kind almond drink. The beverage held two different flavors of almond -- bitter and sweet -- and the combination was quite nice, if fleeting. Kind of like a mini-shot of Amaretto di Saronno. We hoped the bitter part of the meal was behind us, and that the sweet part remained. Aaron had seen a soufflé in passing and, being the optimistic guy he is, figured a soufflé would be a safe choice for dessert. 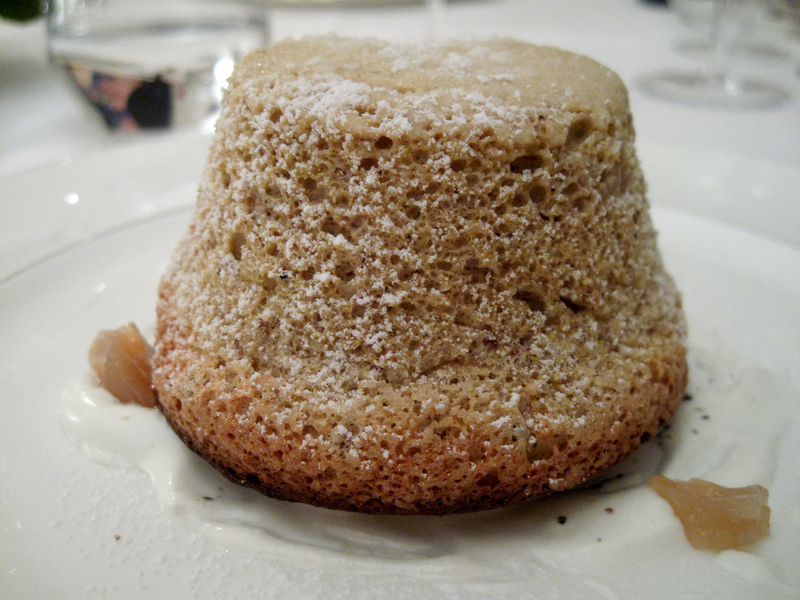 It was a soufflé al pan pepato, schiuma di latte e rhum and would presumably mimic the flavors of the panpepato we had eaten that very afternoon at Nannini in Siena. . The soufflé was served out of the ramekin which meant we had better dive right in or it would cool down. The first flavor was redolent only of black pepper, as was the second and third. The strong, boozy hit of the rum gelatin decimated any sweetness that might have been present inthe milk foam. This taste unfortunately took over any split second that the pepper could not be detected. Another let down. Aaron looked like he just wanted to cry. There was no hope left. The petits-fours came were a very welcome sight, as we were now starving looking for something sweet We were given a small lime tart, an almond tuile, chocolate truffles, a liquid-filled white chocolate truffle, and a cough drop spiced dark chocolate truffle. Aaron had the latter first, and was unable to taste anything afterwards. Thankfully he warned me and I started from the other side. The meal had ended and our friend explained that he found it exceptionally interesting and delicious, and said he is now certain about his prior inkling that Lopriore is the best chef in Italy right now. Aaron and I sat there angry and confused. 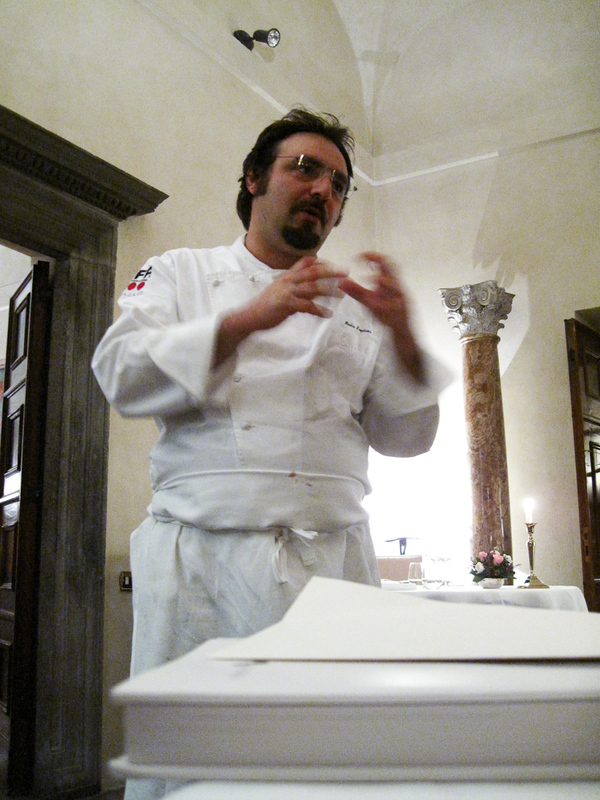 Chef Lopriore came out of the kitchen, a jovial and enthusiastic man, to ask what we thought. I was diplomatic in my response. I explained that I certainly tasted new flavor combinations, some of which were startling, and chef Lopriore smiled, "that's the idea." Aaron stuck more with the "If you don't have anything nice to say..." school of thought, merely nodding occasionally. Lopriore is certainly bold and audacious to serve these flavors, that's for sure. Perhaps he tastes things that we do not. The chef was a very friendly and overall likeable guy; I just didn't like his food. At all. Aaron and I continued to discuss this meal for the days to come. This experience was unlike other bad restaurant experiences we'd had; something was different. When chef Lopriore served flavors that I disagreed with, it was controlled and intentional, even if the flavors were horrible to my palate. It's not like I could dislike Il Canto for his poor skills or technique -- he's certainly very talented and his cooking reflects that. But a new experience or new flavor should always be secondary to whether or not the dish's taste is actually appealing. This is a restaurant, not a taste labratory. Aaron swore never to return, saying he's not interested in being a lab rat to experimented on by developing chefs. I think I would give him another shot, however. Too many of Lopriore's dishes had tremendous potential for me not to return, and I think it's possible to work them out. But it's going to take some time, and meanwhile, there are other places to visit.